The Anubis tattoo is the image of a dog-headed god of the dead. Anubis is supposed to watch over those souls who have passed into the afterlife. Typically, you will see Anubis placed in front of various structures, like a Pyramid. 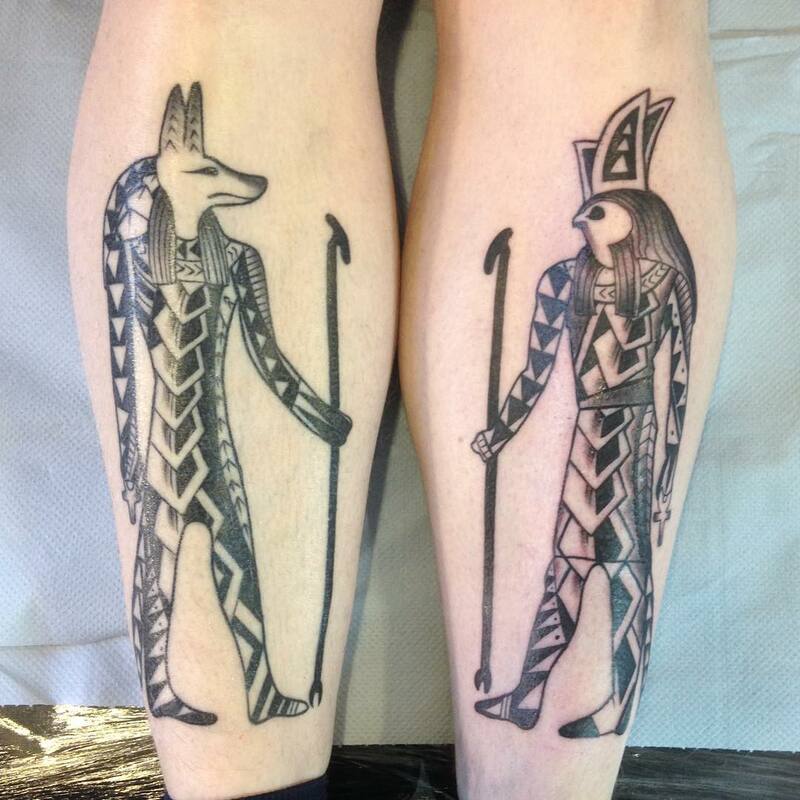 You could also see the tattoo placing Anubis over someone, as in keeping watch over them. The most common placement of this kind of tattoo is on the back of someone, as this represents someone watching your back at all times. When using Greek, the name Anubis interprets into the Ancient Egyptian god of the dead and afterlife. In ancient mythology, Anubis was considered one of the most enigmatic and mysterious gods in Egypt. His assignment was to protect the people who were going to the afterlife while he was in charge. However, there are many ways to interpret the symbols that were left for us. He was half human and half jackal, with the upper half of the body as a jackal and the lower half of the body portrayed as human. He has been seen in hieroglyphics as both sitting down and standing up, which makes it unclear on his true status, as when he was sitting down, it was in a dog like a stance. Some people make the case that he played almost no part in classic Egyptian mythology, while others have seen this symbol on topics such as protector of graves, an embalmer, the lord of the Underworld and/or the carrier of souls. Most people who see Anubis tattoo interpret it as a god who looks after those who have gone into the afterlife. One interpretation of this symbol is, as the god of the Underworld, he would literally weigh the heart of someone. The weight of the heart would determine whether or not each soul would make it into the afterlife or not. In Ancient Egypt, this role was quite important, as all Egyptians during that time believed the best gift they could ever receive was a passage into the afterlife. In contrast to this, there are some historians who believe you can interpret the symbols of Anubis as one that is opening the way for something, rather than closing the door on life. This brings a whole new life to the discussion on what the role of Anubis was during Egyptian times, and what it should truly symbolize in today’s culture. There are plenty of people in society today who, like the Egyptians of old, believe in some form of an afterlife. They want to believe that someone is watching over them from the afterlife and taking care of certain things within their life here on Earth. 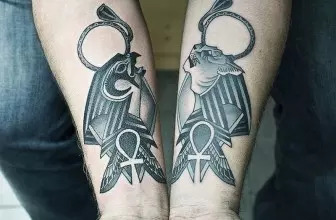 The Anubis tattoo is one that is most often seen on people who have this perception. To them, it represents a certain loved one that is present to help them get thru certain circumstances. People also have this tattoo as a motivation for themselves, driving them to a place where they will not ever give up, no matter how tough a situation might be. These people hold a deep-rooted belief that someone from the afterlife is watching them, and giving them the strength and energy to make it thru the struggles and tribulations of everyday life. With the new thinking that Anubis could actually be opening a door, rather than closing a door, brings this whole thought process into a new light. This symbol could represent the idea that there will always be new opportunities for you in life; all you have to do is walk thru the door. This could provide the motivation for some people to drastically change course in life, or start a new career, or just turn over a new leaf in life. In today’s society, it provides great meaning to those who choose this symbol, no matter which interpretation it might represent. If you are a dog owner, you may want to get a tattoo of a dog to help represent your relationship and bond with your pet. 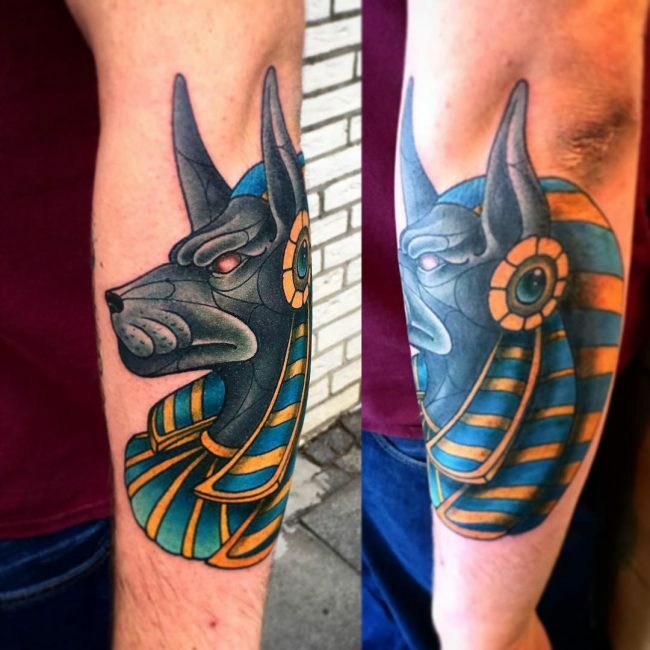 The Anubis tattoo is one that is popular among dog owners. This tattoo projects a few different traits. The first is protection, as the perception is most dogs will guard their owner against any danger, keeping them safe and protected. The second is guardianship, which means that dogs will guard a house, even when the owner is not around. The third and last quality is loyalty, where the dog will go where the owner goes and do what the owner does, all in an effort to ensure the owner stays safe at all times. All of these traits are perceived to be common in all dogs. Some owners may even get this tattoo as a way to offer safe passage of their pet from earth up into the afterlife, so they can make sure to have their pet with them in the afterlife. The tattoo is still similar to other tattoos, but where the head is that of a canine or a jackal, and then the rest of the form is a human body. By having this tattoo, owners typically believe there is a spiritual force in play between their canine and themselves, deepening the bond between owner and pet. 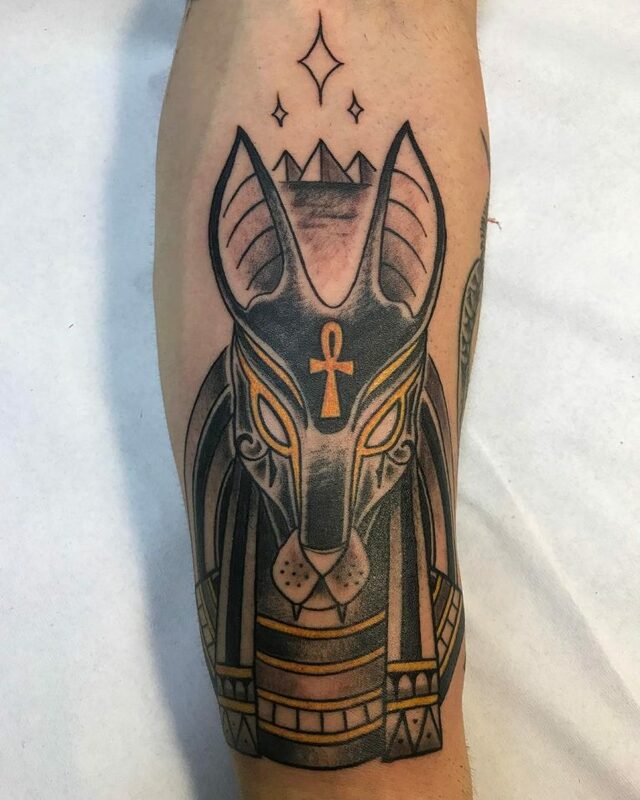 There are a lot of deep and spiritual meanings tied to the Anubis tattoo, all of which can be interpreted in various ways. There is a deep desire among all people, both in the past and in the present, that there is more to this life than what is currently seen. Most people want to believe that if there is an afterlife, they will do enough good things to ensure they make it into the afterlife so they can see their loved ones, both human and dogs. Only you can determine the right tattoo for you, and where the best place is on your body to represent it’s meaning to you.